NL1732 Grade T Twin Weld is a premium welding hose with an oil and flame resistant cover and tube. It can be used with most current fuel gases, including acetylene, propane, and MAPP gas. This hose is sometimes also used as a deadman sensing hose in sandblast or aircraft refueling applications (although a proper deadman hose should be used). Typical Fittings: N450 Brass barbs with N450 Oxygen and N451 Acetylene brass nuts, FBL & FBO brass ferrules. Construction: Tube: Black neoprene rubber. 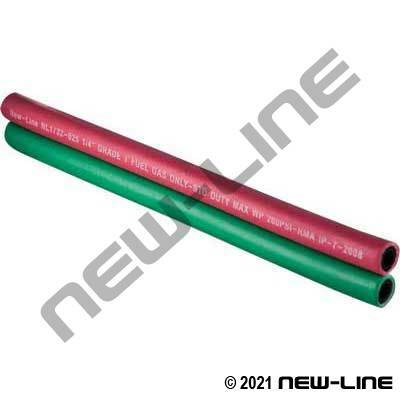 Cover: Smooth neoprene rubber (red for acetylene and green for oxygen). Reinforcement: 2 textile spirals. Detail Comments: Due to its superior resistance to the fuel gases used in welding, cutting & allied processes, oil & ozone Grade T welding hose is the only recognized by CGA.